More than 500 different kinds of beer! “De Dulle Griet” is located at Vrijdagmarkt, Ghent where Jacob van Artevelde is keeping his eyes on the café. Near the Vrijdagmarkt square there is an artillery piece from the 15th century, “De Dulle Griet”. 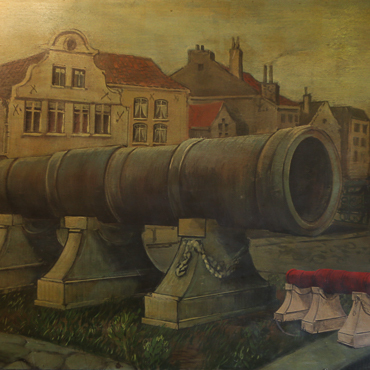 Not only does the café owes its name to the cannon but also to the famous painting “Dulle Griet” by Pieter Brueghel on which a “dulle griet” can be seen. Do you wish to attend the Trappist beer tasting in a group? Reserve online and taste our Belgian or foreign Trappist beer, complemented with cheese & salami or Trappist paté. Reserve online and taste our Belgian or foreign Trappist beer, complemented with cheese & salami or Trappist paté. 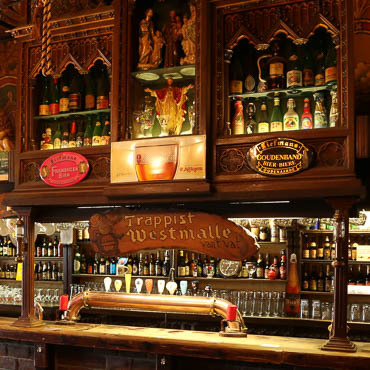 Talkcafé “Dulle Griet” has the largest collection of Belgian beer in Ghent. Come visit us and have a taste of the world famous Belgian Trappist beer or the hidden treasures from unknown breweries. Our MAX beer is known beyond the borders! A fresh pot of beer for a moderate price, served in a genuine coach glass. Ask anyone from Ghent and you&apos;ll hear: a beer pub of course! Oh yes, is that so? If the owners André and Françoise would like a direct link to their tavern, they would&apos;ve called it "Under the tower" or "Pub of the thousand beers", right?